Last weekend on our way back from a wedding, my husband and I spotted the outlet mall off the side of the highway! Although plenty ready to be home, we both insisted (actually, I insisted and he obliged) we do some "field research" for Classy Not Pricey by evaluating what the outlets had to offer first hand. We wanted to know... were they really a great deal? An excellent way to shop for classy brands at non-pricey discounts? Each outlet mall, of course, has different kinds of stores. We were thrilled to find ourselves walking through a (truly) premium outlet with fantastic brands that aren't always outlet options. 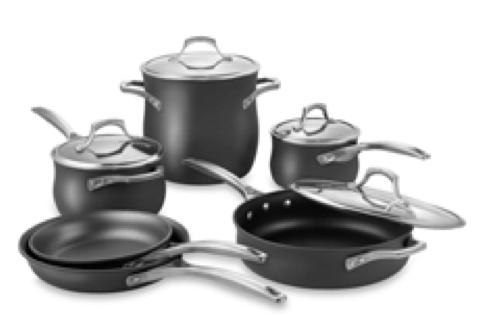 At the end of our research, we were excited to report not only great lessons to pass along to you all, but also a major success story for ourselves on some incredible Calphalon Unison pots and pans. These things are the king of all cookware - they slide or sear, depending on your needs, are oven safe, AND you can put them in the dishwasher. Plus, with the lifetime warranty, you simply can't go wrong - they will truly last you a lifetime. However, these babies are EXPENSIVE when purchased at full retail. So while I've been crossing my fingers and watching every sale for the last five months to try and find them at a great price, I was beside myself to finally find them at a price I believed was more than fair for the quality and value. 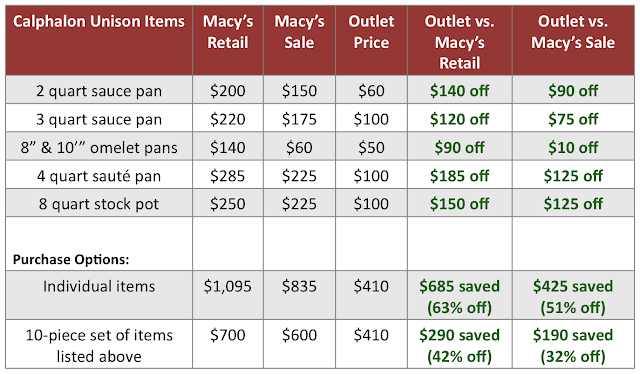 In the end, we already had two omelet pans at home (same price as the outlet), so we walked away with the full set for 51% off of what we would have bought individually from Macy's during their current sale. That's $425 saved! Know how to find true original products versus made-for-outlets items. Ask someone in the store where they receive their items from and, if applicable, which items are simply overstock from the main stores. Many employees of these retailers will help you through the merchandise to find the best steals. Otherwise, much of the merchandise available is actually made FOR the outlets with lesser quality materials and unique designs. Be sure to have a discerning eye. Keep your smart phone handy. Don't be shy to look up the real items (and prices!) 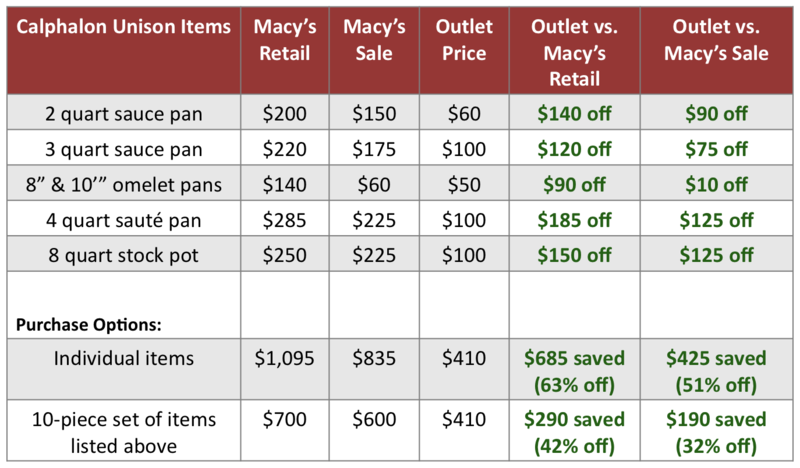 of items that are for sale from the retailer directly or at department stores (versus the outlet). You might find the best deal is actually at your local store or online... and with a better return policy. Double check all items for defects. It is sometimes the case that merchandise at an outlet is there because of a production flaw (or refurbished items, etc.). Be sure to try clothes on, check the balance of home goods on a flat surface, and so on. Don't forget, Overstock.com is the ultimate online outlet! Do you have any favorite outlet success stories? What other online outlet sites have you found? In the end, our research came through - a "rest stop" at the outlets can almost always bring a Classy Not Pricey deal home.